Readers of this blog know I do very few book reviews, mostly because I simply do not have the time or bandwidth to actually read the many books sent here to the 434th floor of the gleeming Airplanista HQ Tower. Sometimes, the subject matter just doesn't amaze me. "The History of my Cessna 150 - From First Tank of Gas to That Time Over Ottumwa When I Had to Go to the Bathroom Really Bad" is not a tome that moves my needle. But every once in a while, a publicist emails me with an offer to review an author's book that I absolutely cannot refuse. 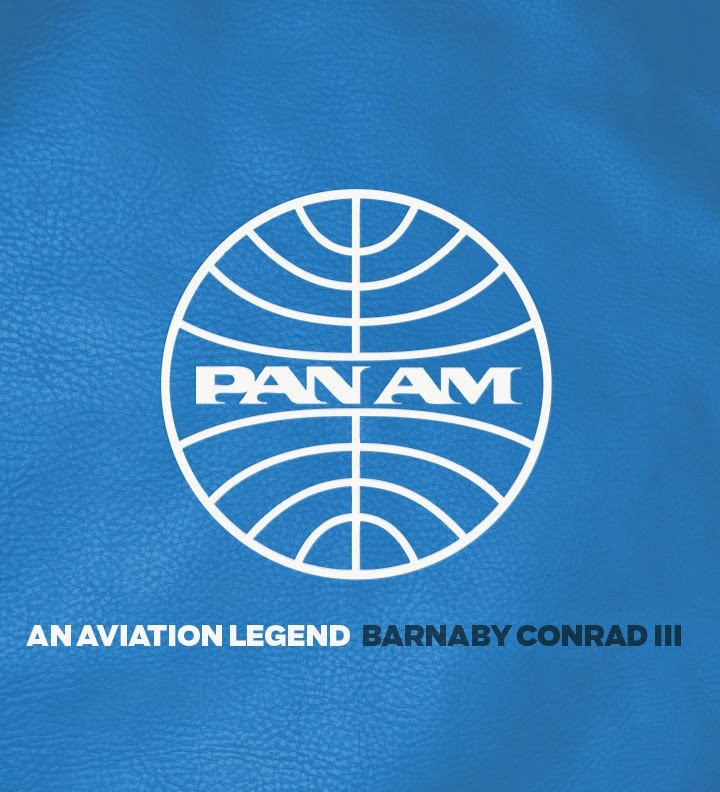 This review of Barnaby Conrad III's Pan Am: An Aviation Legend is one of those times. 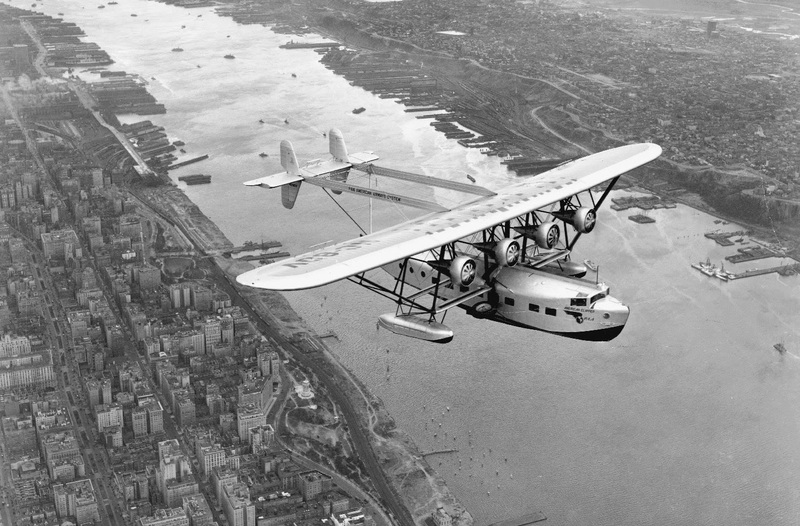 "Pan American World Airways wasn't merely a successful airline, it was the aviation company that helped create what Time Magazine Publisher Henry Luce called 'The American Century.' Combining audacity, vision and service, Pan Am embodied the nation's spirit of enterprise and ingenuity, and exported it on wings. Juan Trippe named Pan American's aircraft 'Clippers' harking back to the great sailing ships of the early nineteenth century. Employing new technology and bold management, the new merchant marine of the air linked cultures, economies and people on six continents." Hudson River and Manhattan on October 12, 1931 (BCII). Conrad III does an impeccable job of painting a glorious picture on every page, with a story that is complete, well-researched, and literally forces the reader to turn the page and soak in more of this luscious prose. With chapters entitled "Bold Dreams and Acts of Genius", "Crossing the Pacific: Nothing was Impossible" and "The Jet Age: Inventing the Future," Pan Am: An Aviation Legend takes the reader on a journey that is as colorful as it is complete. Conrad III begins by putting the reader at Roosevelt Field on May 20, 1927, standing next to Trippe as he watches Charles Lindbergh depart on his historic Atlantic Crossing flight. Tripp soon invests in Colonial Air Transport, and buys two Fokker F-7s for $37,550 each before expanding his presence in the fledgling commercial airline industry by flying mail to Cuba from Key West, Florida - that following a power play that allowed him to take over two smaller lines, Florida Airways and Pan American Airways. On one page, this book - designed brilliantly by Tom Morgan - puts the reader inside a vintage airliner with men in suits and women in fine dresses, sipping an Old Fashioned and toking on a Pall Mall as one of Pan Am's mighty S-42 Sikorsky "Clippers" lumbers overnight towards Hawaii. But on the next page, superbly-optimized vintage photographs illustrate the scenes of these historically-important ships in vivid color, gorgeous grayscales or tones of sepia. 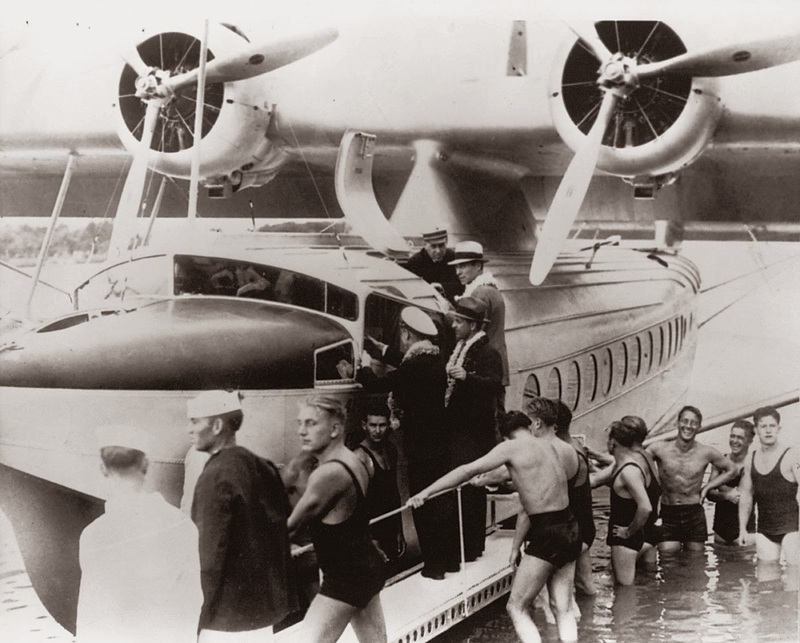 swimwear hauled the Sikorsky S-42 to shore (HASF). While the words are captivating from beginning to end, it is these photographs that drew me in and kept me engaged. This is a plentiful collection of images that show this era of commercial aviation history from every angle. Not only are there the scenes you expect - well-dressed travelers lounging in luxurious cabins - but also numerous aerial shots, images of boarding, maintenance scenes, flight decks, scans of tickets, inside of terminals...everything to keep any aviation history reader enthralled with each turn of a page. "This book is really about what America once was and could be again, perhaps. The author tipped his hand a few years ago when he wrote a genuine masterpiece of a coffee table book, THE MARTINI. Like that book, a delight to read (and as beautiful designed by Tom Morgan as PAN AM is), this book is about an aspect of American elegance that seems to have been replaced by a crude kind of arrogant upscale consumerism. But on a simpler level this book is just about the sheer joy of luxury travel in a time when the world was much bigger than today, and a white shirt, a bow tie, and leather shoes not considered the mark of the White Male Oppressor. Today we live in the age of tourism; this book celebrates the Age of Travel, which ended in the years after World War Two. Since when did a dozen airplanes -- production of the last Clipper model B314 built by Boeing was a mere twelve -- inspire nostalgia like these? Like Elvis, Pan Am was purely American, and one of a kind." Conrad III, the author of ten books, graduated from Yale in Fine Arts and was a founding editor of Art World and senior editor of Horizon Magazine. As a journalist living in Paris, he wrote for Pan Am’s Clipper Magazine as well as for The San Francisco Chronicle, Sports Illustrated, Smithsonian, Condé Nast Traveler, and Forbes Life, where he served as Editor-at-Large. The author's large body of work contributes to the classy presentation of Pan Am: An Aviation Legend, with each word being relevant and important. There is no filler here, this is Filet Mignon for the brain. Crack the hardcover and savor a few bites. If you have a shred of aviator in you, soon you'll be curled up in a comfortable chair, feasting on an aviation history delicacy that will be impossible to put down.